SCHOOL holidays started with hundreds of gentle cuddles at the Kingaroy Shoppingworld this morning. 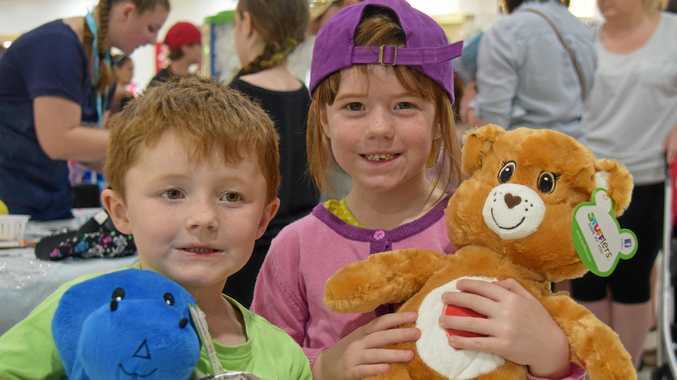 On Monday September 24, hundreds of kids, both young and old lined up to make sure they didn't miss out on the chance to build their own cuddly, lovable bear. The opportunity to get hands on and build your own bear is a unique school holiday opportunity and it seemed many students had it on their must do list for this holiday break. Brought together by bear building business, Stufflers, children were able to select their own bear, choose an outfit, put in the stuffing and even add the squeaky component to their new best friend. Regardless of the huge crowd, everyone was in good spirits and there will be many newly built teddy bears enjoying some loving cuddles come bed-time tonight.